Until last week. 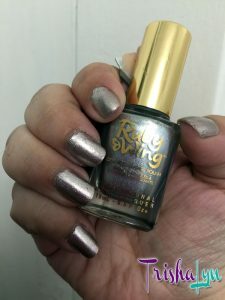 On a day trip to Pier 39 with Lorenza, we went into the Del Sol store there and I remembered that I’d bought this Ruby Wing Color Changing Nail Polish in Meadow but wasn’t sure I’d ever tied it. Since Lorenza went straight for the nail polish, and we were there kicking off her birthday weekend, I decided that my manicure for all the birthday outings should be my color changing nail polish! A lot of the polishes from Del Sol and the polishes that my local shop had have a somewhat subtle transition. For example, the polish Lorenza almost bought was Del Sol Color-Change Nail Polish – Something Blue which went from a light blue inside to a dark blue outside. Not dramatic enough for me! The Del Sol polish I bought in Tampa was Don’t Be Jealous, which turns from a shimmery blue to a shimmery green. So when I saw this Ruby Wing went from a basic silver to a deep purple, two of my favorite colors (as evidenced by my wedding), I knew that was the one for me. Ruby Wing is about half the price of the Del Sol polish, and went on in almost one coat. It wasn’t quite as opaque as I like, so one medium coat plus one thin coat did the trick. Instinctively, I did put on a top coat, my go-to Glisten & Glow HK Girl – Fast Drying + Super Shiny Top Coat before thinking about weather it would interfere with the UV reactive properties of the polish. 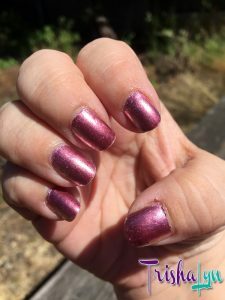 For a few days, I kept looking at my nails to see if the color changed but I always ended up looking at them while in the car or sitting inside holding them up to the sun coming through the window. Turns out that the glass blocks the UV reaction whereas the top coat doesn’t block it at all. I kept forgetting to look down at my nails while outside going to & from the car or waiting outside of the restaurant for Lorenza’s birthday dinner, so I made a trip into the back yard specifically to make sure the color change was working and voila! Lovely purple shimmer! The UV reaction happens pretty fast on my nails, though it doesn’t change the whole bottle of polish as dramatically, but that’s okay. It’s not like I’m carrying around the bottle to show people! So I’m very happy with this purchase, all these months later, and I think I’ll pick up another couple of Ruby Wing color changing nail polish colors for some spectacular summer nails!